(Bloomberg) -- Investors can’t seem to get enough of Australian bonds amid worries about an economic slowdown. This week’s employment data may just whet their appetite for more. 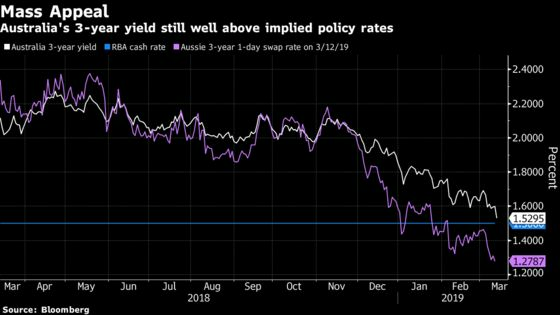 Australia’s 3-year bond yields have dropped almost 50 basis points since early December to within a whisker of the central bank’s 1.5 percent policy rate. Short-dated bonds have proved popular as markets dialed up expectations the Reserve Bank of Australia will have to reduce interest rates. While consumer sentiment and growth have worsened amid a property slump, the unemployment rate has been one consistent bright spot for the economy. Hovering at just 5 percent, close to the lowest levels since 2012, the release on March 21 may set the tone for the RBA’s next policy meeting in April. The key for rate-cut expectations will be the labor market, according to Skye Masters, head of interest-rate strategy at National Australia Bank Ltd. “Our bias is the cut will come earlier rather than later” as the central bank’s positive outlook for the labor market is unlikely to be fulfilled, she added. 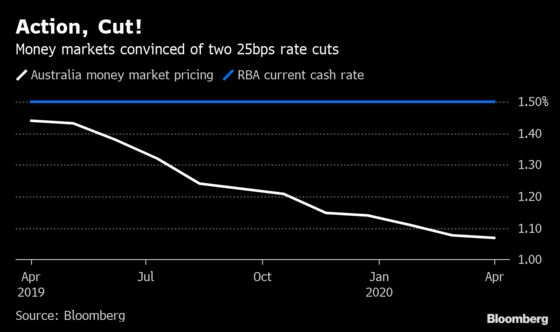 Money markets are now pricing in a 25 basis point rate cut in August, with another in the second quarter of 2020. The aggregate open interest -- a measure of total outstanding positions -- for Australia’s 3-year bond futures have surged to a record high of 2.3 million contracts. Susan Buckley, managing director of global liquid strategies in Brisbane at QIC Ltd., which oversees the equivalent of $60 billion, is one fan of 3-year debt. While “a fair bit is starting to get priced in” to short-dated debt, QIC remains comfortable building a long position in 3-year paper to hedge risks its taking elsewhere, including corporate bonds, she said. However, there are things which could limit the continuing drop in yields. One may be election-driven spending as the Liberal coalition government seeks to reverse sinking ratings with its April 2 budget. But Hamlyn also sees potential for the decline to keep going.